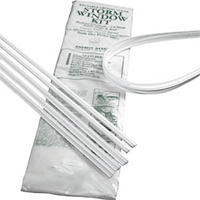 The Tyz-All storm widow kit is used to stop the infiltration of cold air into the home during winter. Each kit contains a plastic spline, channel system, and installation instructions. It is ideal for use on windows measuring 38" x 64" or smaller, as the plastic can be cut to size. Attach the lengths of the plastic channels around the frame of the window. Take the clear vinyl sheet, and spread it across the face of the window, using the spline (thin, plastic strip) to hold it in place. Lock the plastic strip into the channel. If necessary, cut the spline and channels with a utility knife. The vinyl can be cut using scissors.